Jerome "The Legend" Coyle awaits a pitch during the 1998 NJWA Summer Showdown championship game at Pat Pone Park in Trenton, while a crowd of spectators looks on. Walking down Chestnut Avenue in Trenton, New Jersey, the last thing you might expect to find is a ball field of any kind. The sidewalks and streets are cracked and in need of a paving. Old brick houses line up side by side, barely leaving any room for a yard. Where there is grass, it is extremely overgrown. But right there on Chestnut Avenue, just between Grand Street to the north and Elm Street to the south, lies Pat Pone Park – at one time one of the great parks in the game and the epicenter of the Wiffle® Ball world. Growing up on Chestnut, Mike Palinczar’s family home was one of the few in the neighborhood with a yard big enough to actually play ball in. A young Wiffleczar takes a hack across the street from his childhood home. The brick wall in the background served as a de facto strike zone and backstop. At maybe fifty or sixty feet in length and 15 feet wide, the yard was just large enough for a kids’ Wiffle® Ball game. When Palinczar and his friends outgrew the yard, they moved their games to the street. The width of Chestnut avenue between the Palinczar residence and a brick building across the way was just about 42 feet – a solid Wiffle® Ball pitching distance. The enterprising teenagers hung a thick metal sheet off of a knob in wall. The sound of plastic hitting metal – a loud and unmistakable “clang” – signaled a strike. Neither the yard or street setup was necessarily ideal, but it got Palinczar and his friends through many hot Trenton summers. In 1990 at the age of 18, Palinczar got his first taste of competitive Wiffle® Ball when he and some neighborhood friends entered a tournament in south Jersey and then later that same year, competed in Rick Ferroli’s World Wiffle® Ball Association (“WWA”) national championship in the Boston suburbs. After the national tournament, Palinczar knew he wanted to bring what he saw in Boston to his hometown. Tough and determined even at a young age, the Trenton native was confident he could get a league off of the ground if only he could find a spot to host the games. The make-do solutions of his father’s yard and the adjacent street were inadequate for a real league. The local baseball fields required permits and would have to be shared with youth baseball leagues. That was not practical for a league that planned on running games every day during the summer. Palinczar needed something else. It was Mike’s father, Vic, who offered up the solution. Pat Pone Park was a largely abandoned park and playground area just a stone’s throw away from the Palinczar residence. The Park did not get much use, at least not for its intended purposes. Neighborhood kids with nothing better to do spray painted graffiti and broke bottles in the asphalt area. Other than that, the Park was largely left alone. Vic suggested to his son that should get the city’s permission to turn Pat Pone into a ballpark. Former Trenton Major Douglas Palmer (1990 - 2010) personally mans a bulldozer as construction on the Pat Pone Wiffle®Ball park gets under way in early 1991. The bottle littered blacktop area just so happened to be the right dimensions for a small ball field. Trees overlooked all four sides of the Park, which served a dual purpose of keeping the wind out and providing shade to players and spectators. The steps that lined both sides of the north entrance – where the first and third base lines would eventually be – could seat spectators. Streetlights that towered over the park could provide ample lightning for night games to be played – if only the city could be bothered to get the power turned on. The Park needed a lot of work to be game ready but in those ways it was already almost the ideal – if not rather unlikely – spot for a professional level Wiffle® park. Palinczar and his friends got the go-ahead from the city and in March of 1991 set out to create a Wiffle® Ball paradise. They worked tirelessly over the next several months cleaning up the graffiti, repaving the asphalt, and lining the field for play. The city even eventually got around to flipping on the power for the streetlights so that games could be played at night. Pat Pone hosted league games and the New Jersey state tournament in 1991. For the next decade, Pat Pone Park was among the most prolific parks in the fast pitch game. 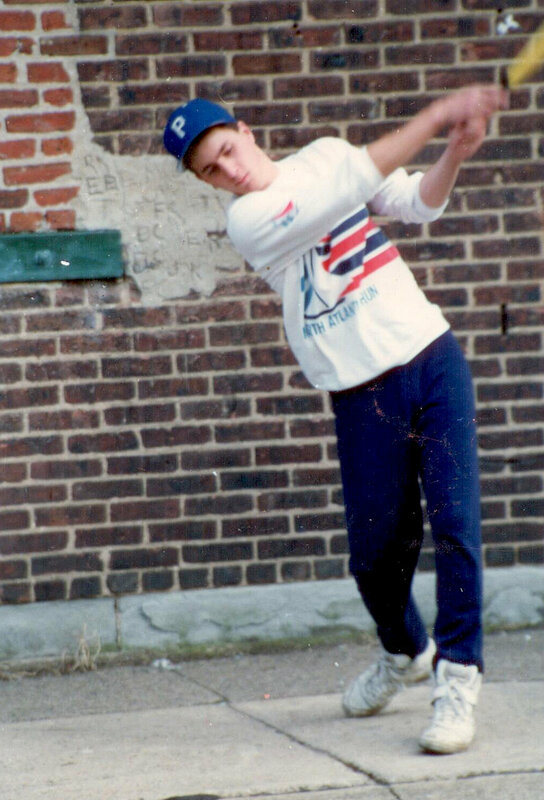 The New Jersey Wiffle® Ball Association (“NJWA”) operated as a WWA feeder organization through 1992, went dark for two years, and re-emerged in 1996 with an annual summer tournament. When the Cincinnati based North American Championship dissolved after their 1997 event, the NJWA assumed the mantle as the top organization in the fast pitch game. The group’s summer tournament – the Summer Showdown – was the most competitive tournament in the country between 1998 and 2000 and the de facto National Championship. That placed Pat Pone Park at the center of the scene, with the championship-round games (in addition to select earlier round games) emanating from Chestnut Avenue. If a team was to be considered one of the best during the 1990's, they had to play and win at Pat Pone Park. This picture - taken at Pat Pone just before the final day of the 1998 Summer Showdown - includes such illustrious teams as In the Box, Georgia Longshotz, Brown Hornets, Fluffheads, PA Cards, and Lakeside Kings. The players that competed in the championship round games at Pat Pone form a veritable “whose who?” list of the late 90’s scene: Jerome “The Legend” Coyle, Darren “The Natural” Bone, Billy “The Kid” Owens, Bruce Chrystie, Tom LoCascio, Dan Cryan, Mike “Salt” Soltesz, “Sweet” Lou Worthington, Mark “The Big Bopper” DeMasi, Rich Ewald, and Fred “The Hammer” Bastedo, to name more than a few. Many of the championship round games played at Pat Pone during those years have become the stuff of legend. There was the controversial 1997 championship series between the Lakeside Kings (Coyle, Owens, Cryan, and Bone) and the hosts, Team Trenton (Palinczar, Bastedo & Saltesz), where the validity of the championship format is still disputed by the relevant parties to this day. In the end, it was Palinczar – pitching both games of the championship round – that brought home the trophy for Team Trenton. Despite the disappointment of 1997, Pat Pone was rather kind to the Kings, who put the finishing touches on championship runs on the blacktop field in both 1996 and 1998. Pat Pone was also the backdrop for one of the all time great pitching performances in fast pitch tournament history. The Georgia Longshotz – Owens, Demasi, Ewald, and Ryan Daugherty – drew the short stick at the 1999 Summer Showdown with Lakeside, the upstart Carolina Whiz Kids, and a hungry Stompers/Busers combined team in their bracket. Things went from bad to worse for the Longshotz when they dropped their second round game to the Kings and had to battle their way through the loser’s bracket. Relying exclusively on Owens’ right arm, the Longshotz fought back and when all was said and done, they had beaten a murderer’s row of the Kings (twice), Whiz Kids (twice), Fluffheads, New England Iguanas, and Tri-State Terror to capture the title. No other field – with the possible exceptions of Lakeside Park and the Fast Plastic National championship field in Cedar Park, Texas– has witnessed as many big games and big performances as Pat Pone. Phil Levonchuck (Fluffheads) about to deliver a pitch at the 1998 Summer Showdown on Pat Pone field. Google “Wiffle® Ball fields” these days and you will be overloaded with creative and gorgeous fields all over the U.S. What you will find very little of – if you find one at all – is an urban park woven right into the fabric of a major city. In that regard, Pat Pone was – and still is – in a class all to itself. Pat Pone Park was a city ballpark through-and-through, for better and for worse. There are stories of neighbors yelling at teams for making too much noise and of kids causing trouble around the way. However, the city location also meant frequent passers-by stopping to take a look and a continuous bustle of activity around the Park. Isolated fields with green grass and trees as far as the eye can see can be great of course, but its urban setting – the fact that the park and Trenton are inseparable – is what made Pat Pone so unique. So did, for that matter, the complete lack of grass or dirt on the playing surface. Asphalt fields are extremely rare in this sport. Rather than view that as a detriment, Palinczar spun it into a positive. The NJWA boasted the fact that they had – to their knowledge – the first and only professional blacktop field. Players yearned to play at Pat Pone because of its rich history, but also because it meant an opportunity to play on a field and playing surface that was wholly unique. The city vibe and unique playing surface – which went hand-and-hand – helped Pat Pone gain a reputation as a bucket list ballpark. Pat Pone was a destination spot for wifflers because it provided a playing experience that could not be replicated anywhere else. A view of Pat Pone from just behind the pitcher's mound with neighborhood houses in the background. The field's location in the middle of a Trenton neighborhood was one of its defining features. This August on an unseasonably pleasant afternoon in Trenton, I walked down Chestnut Avenue with Palinczar and his son towards Pat Pone Park. The Park stopped hosting Wiffle® Ball games around 2002 but continues to exist as a normal neighborhood park and playground area. I hadn’t been to Pat Pone since 2000 when my team was lucky enough to play all of our NJWA summer tournament games there. Two months prior while in southern Illinois, I stopped by the former site of another legendary park, Lakeside Park in Granite City. There was not much to see – three holes representing where home, the pitcher’s rubber, and second base used to be – and little else that would indicate a great stadium ever sat there. After seeing what was left of Lakeside, I tempered my expectations and assumed the 2017 version of Pat Pone would offer more of the same. VIDEO EXCLUSIVE: Mike Palinczar gives The Drop a tour of Pat Pone Park in August 2017. The difference between a ballpark like Lakeside and one like Pat Pone – both brilliant in their own ways – is one could have been built on any good sized piece of land and one was a product of its environment, inseparable from the structures around it. For that reason, even having not been used in tournament play in a decade and a half, Pat Pone still retains much of its charm. When we arrived at the iconic park, it was like we were all transported back in time. Palinczar stepped onto the field to show us around – using a fungo bat to point to the Park’s features that were still there as well as some that no longer were – and the excitement and affection he felt for his field was palpable. Always with a knack for details, the “Czar” excitedly showed us where railings were missing on the outfield wall, how the trees used to be flush to the playing field, and how the field drained when it rained. His excitement was contagious and had someone offered, I would have gladly played a pick up game right there in my sandals and shorts. As we prepared to leave, someone in the group mentioned that, relatively speaking, it wouldn’t take much to get the field into playing condition. Palinczar tilted his head sideways; not necessarily agreeing but not dismissing the possibility either. Another member of the Palinczar clan – Mike’s twelve-year old son – seemed more confident. “We can fix it up. A few of my friends can come over and we will clean it up,” he remarked, pretty much describing how his dad got the field built a quarter of a century earlier. Clearly tenacity is a Palinczar family trait. The Czar has tentative plans to revive the NJWA in 2018 for a tournament or two. There is no guarantee that Pat Pone will be part of that revival. Regardless, if the NJWA does return next summer, make it a point to go. And when you do go, do yourself a favor and take a drive down Chestnut Avenue to Pat Pone. It is worth the trip. In a sport that is short on tangible history, Pat Pone Park stands as of the sport's most treasured historical landmarks. Mike Palinczar never stopped upgrading the field at Pat Pone. This picture, taken in the early 2000's, shows a green wall in right and center field, along with a fresh coat of paint on the blacktop, and a new target strike zone & backstop to replace the old "hole" strike zone design.